The Padua Charity Fund has started a special scholarship program for bright talented individuals with good high school grades who can not afford to attend college. 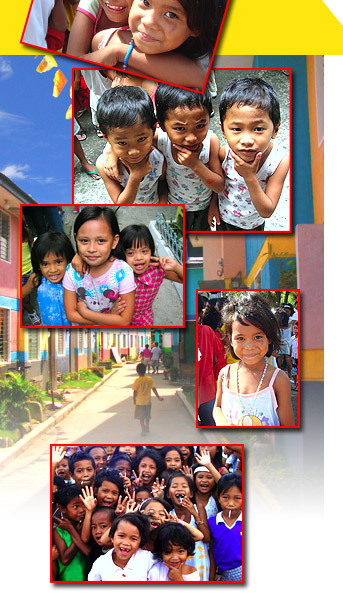 These young students are chosen from underprivileged areas in Manila. This year PCF donors have selected two new students who will benefit from the PCF programme in honour of Eleanor McCarthy. Above: Scholars April and Jhun in the PCF library at the GK El Dorado site in Manila. Our first awardee is Jhun Agang who is attending the City University of Pasay (Pamantasan ng Lungsod ng Pasay), studying business management. His high school grades are exceptional and he successfully passed the PCF entrance written form and interview. Our second selection has been awarded to April Jayne Fajardo. She is 16 years old and is currently studying accounting at Lyceum University. April is a delightful young lady and was selected after an impressive interview. Above: City University of Pasay (left) and Lyceum University (right). The PCF scholarship programme hopes to see these two bright deserving students through to the end of their 4 year university courses. We look forward to their outcome. The scholarship programme also contributes to transport, schooling equipment and other expenses. This scholarship is in loving memory of Eleanor McCarthy. Eleanor graduated from Manhattanville College of the Sacred Heart in 1960 with a bachelor’s degree in European history. She taught at schools in Norfolk and in Dryden in New York, US.